Two basic types are analog and digital. The digital Geiger counter is typically more accurate as you can obtain an exact count of radioactive particles detected. Where as the analog meters average out reading, and do not provide a display for the detected particle count. 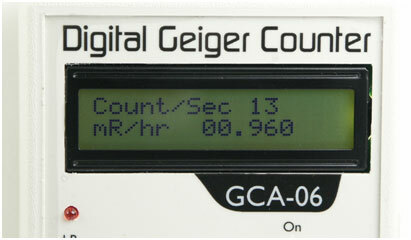 A digital readout from the GCA-06W is shown in figure 8 below. Let's discuss accuracy. While many Geiger counter vendors make a claim high accuracy for their Geiger counter, it simply is not true. Here is where you have to ask what is the reference point for the vendor to claim their Geiger Counter is accurate? Because without a real reference point to compare accuracy too, a claim of accuracy means nothing. Claiming a Geiger counter is calibrated is not proof, nor is it proof to say the Geiger counter has an accuracy of 1%, 5%, 10%, or 20%. Anyone can say that! So how would you know or be able to check this? 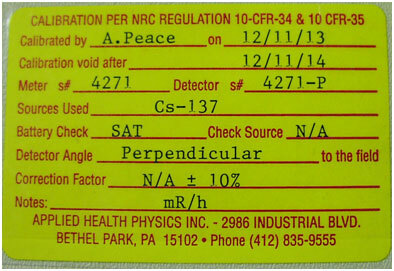 So if a seller claims their Geiger Counter is accurate, ask, "Is your Geiger Counter NRC certifiable?" If not, their Geiger counter is probably not accurate to pass NRC certification. But many times a seller will not just say this outright. Instead the seller hedges and states that the NRC certification is expensive and is not "currently" offered as an option. You can respond. "If I purchase your model and send the unit out for NRC certification will it pass? And if it fails NRC, can I return the Geiger Counter for a full refund?" The seller's answers to those questions will tell you what you need to know to make a purchasing decision. * All digital Geiger counters sold by Images SI Inc. can be NRC certified to their accuracy. There are a number of independent laboratories that are licensed by the U.S. Government to test Geiger counters for their accuracy, and if it is accurate provide an NRC certification label attached that will be attached to the Geiger Counter. The certification is good for one-year.